In 2016, around 52,000 guests visited the BMW Group Event Forum within the framework of award ceremonies, congresses and festive occasions. In 2017, the success story will continue. The BMW Welt, which in addition to the BMW Museum and the BMW Group Classic is the largest location of the BMW Group Event Forum, announced the opening of the Premium Lounge as well as with an award-winning upgrade of existing technical media. The Premium Lounge offers guests and organizers alike an exclusive event area with a unique flair at the heart of the BMW Welt. Comfortable leather couches and a dining area designed in stylish brown and cream tones provide up to 100 guests with a sense of well-being – whether during a dinner, an exclusive get-together or in a club atmosphere with DJ and dance floor. The Premium Lounge presents itself laid-back, modern and classy high up amidst the award-winning architecture of the BMW Welt building. The panoramic glass frontage provides a view of the premiere, the central exhibition area and heart of the BMW Welt building, as well as of the city and its landmarks. High-class catering offered by the in-house catering partner Käfer and excellent service provide the exquisite framework for an unforgettable evening. During the day, the Premium Lounge is reserved for international customers collecting their new vehicles and can be booked for evening events. 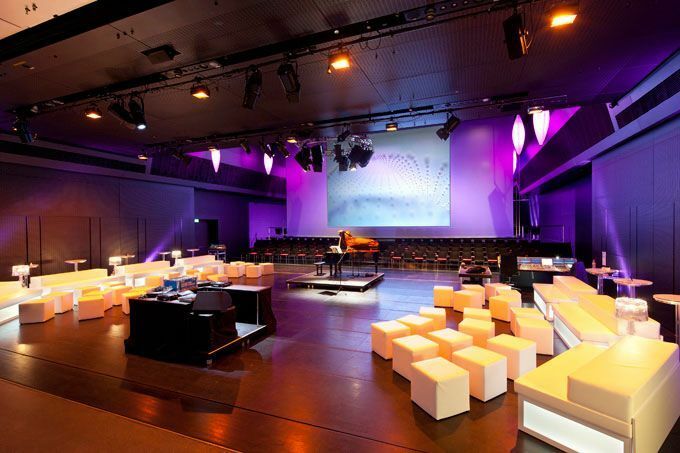 The BMW Welt is starting the new event year 2017 with an upgrade of its event area media technology. In collaboration with the engineering company macom GmbH and the experts for AV systems Kraftwerk Living Technologies, it was possible through state-of-the-art IT and media technology to raise the brand experience at the BMW Welt to a new level. The renewal also offers organizers new and surprising possibilities with enhanced acoustic systems for example, as well as through numerous LED visualization areas. To crown all, the project was even honored in February 2017 with the InAVation Award in the category Visitor Attraction. Event planners and customers alike can choose from a comprehensive package of event services for all three locations. If they wish, organizers are assisted by an experienced project manager. Right from the start, this person advises and assists each customer individually not only with content-related, technical and organizational requirements, but also coordinates, if desired, all services necessary to ensure that the event runs smoothly. Specialists take individual care of the required technical equipment for the stage, video, sound and light. The all-round customer support includes respective staffing, from the hostess service to the cloakroom attendant. The medical service ensures fast help in an emergency and trained security personnel safeguard all event areas. Thanks to individually organized incentive programmes, each event becomes a total experience, whereby it is possible to choose from a wide variety of programmes, from guided tours of the BMW Welt, the BMW Museum, the BMW Group Classic, the BMW Group plant or active driver training. What is more, with BMW on Demand, organizers can offer specific driving experiences in various BMW models – for example in the sporty BMW M3 or the innovative BMW i8, if the customer so wishes. The vehicles can be rented on a daily or hourly basis directly at the BMW Welt. Furthermore, highlights such as product presentations, driving experiences with the all-electric BMW i3 or the BMW Isetta from the fifties can be integrated into a planner’s own events. Moreover, the BMW Group Classic offers exclusive guided tours of the historic collection, the Centennial Room and the workshop, as well as discussions with BMW Group Classic employees. If desired, excursions in classic Group brand vehicles or a shuttle service can be made possible. Those wishing to offer their guests even greater driving pleasure close up will be making the right decision with the BMW Driving Experience in Maisach: Safety or snow and ice training complement any event with multi-faceted action. Catering at the BMW Welt is carried out by the exclusive catering partner Feinkost Käfer and by Kofler & Kompanie at the BMW Group Classic and the BMW Museum. 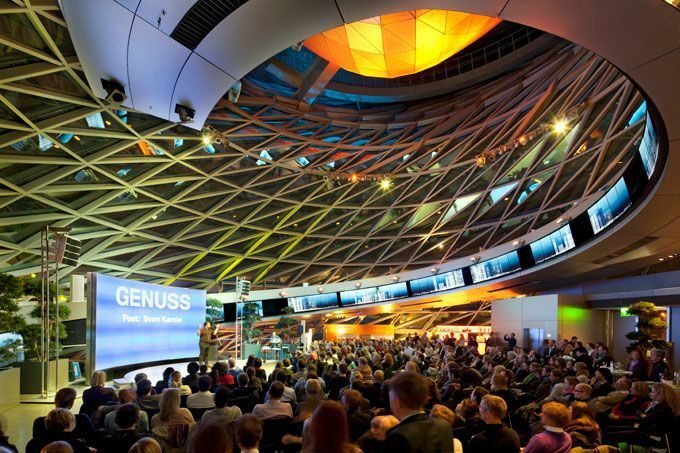 The multipurpose auditorium is the heart of the BMW Welt Event Forum. The flexible room installations and state-of-the-art equipment make anything possible in this 945 m2 space, which can host up to 700 people. The floor of the auditorium is divided into segments, which can be raised or lowered according to requirements – allowing the room to be transformed into a congress or banquet hall, a stage for live performance, an exhibition space or even a cinema with banked seating. The wall at the back of the hall is a vertical gate that can be lowered into the floor, allowing the auditorium to be linked to the foyer. The resulting 450 m2 space can provide an atmospheric backdrop for receptions or exhibitions. Guests in the 100 m2 Business Club can expect an exclusive atmosphere. Whether it be a private round table or an intimate meeting, product presentation or press conference for selected journalists, the Business Club provides the perfect ambience for relaxed and focused events. Two all-glass side walls offer a breathtaking view over the BMW Welt Square and Olympiapark Nord. Whether it be large-scale conferences or smaller seminars, the Business Center’s two conference rooms are the perfect solution. The rooms are flexible and functional and can be divided into two smaller rooms if necessary. The Business Center Foyer is a primary meeting point and place to relax. The comfortable lounge furniture offers space for short breaks between seminars or a small snack to keep participants going. 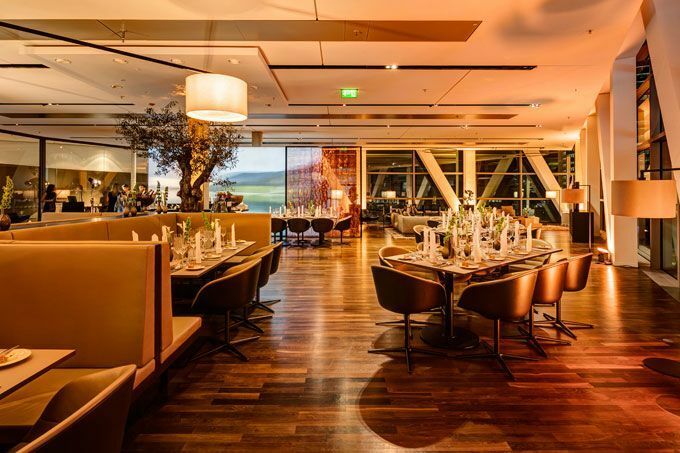 The terraces at the BMW Welt Event Forum can offer an exceptional backdrop for catering events, receptions, gala dinners, after-work events and casual get-togethers. Measuring 200 m2 and 300 m2, the terraces can host between 110 and 130 people in an informal reception. With banquet seating, the indoor terrace holds 90 people, while the outdoor terrace can host some 100 if the weather is pleasant. The Double Cone offers incomparable architecture and atmospheric lighting. Suitable for gala receptions, dinners or private exhibitions, some 400 guests can experience events like no other in the Double Cone. The event location on the former BMW Group industrial site offers premises for workshops each for up to 30 persons as well as a hall with sufficient room for almost 400 persons. In the listed industrial buildings, guests will gain insights into the historic collection, the Centennial Room and the workshop. The Premium Lounge offers guests and organizers an exclusive event area with a unique flair at the heart of the BMW Welt. Comfortable leather couches and a dining area designed in stylish brown and cream tones provide up to 100 guests with a sense of well-being – whether during a dinner, an exclusive get-together or in a club atmosphere with DJ and dance floor. The Premium Lounge presents itself laid-back, modern and classy high up amidst the award-winning architecture of the BMW Welt building. The panoramic glass frontage provides a view of the premiere, the central exhibition area and heart of the BMW Welt building, as well as of the city and its landmarks. High-class catering from the in-house catering partner Käfer and excellent service provide the exquisite framework for an unforgettable evening. During the day, the Premium Lounge is reserved for international customers collecting their new vehicles and can be booked for evening events. The BMW Group Event Forum welcomes all visitors of the IMEX 2017 Frankfurt in Hall 8 at exhibition stand G 160 in cooperation with the Munich convention office.